As diverse as Nature. A complete dog food. Nature provides a great example for our recipe – your dog will adore it. All BLACK ANGUS products consist of a combination of first-class animal proteins, the best carbohydrates and carefully selected plant components. The unforgettable taste is created by the pure natural ingredients. BLACK ANGUS is particularly agreeable as it contains the best nature has to offer. We carefully select all the ingredients and they are checked by independent laboratories, to ensure they meet the MARKUS-MÜHLE exacting quality standards. 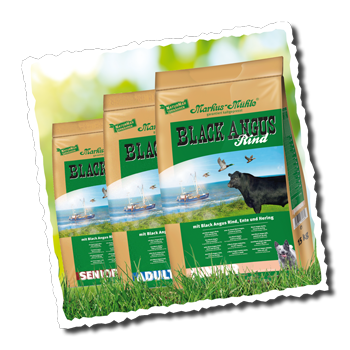 You only get species-appropriate animal food from us and we have developed BLACK ANGUS specifically for puppies, adults and senior dogs. Simply the best for your dog, whatever its age! The Adult recipe accompanies your dog through the best years of his life. Containing a select mixture of herbs and balanced fatty acid content, this recipe can optimise your dog’s metabolism, improve the body’s defences and thereby support the immune system. For puppies and young dogs up to 12 months. Our cold-pressed complete dog food can support the natural development of your puppy and young dog. The Junior recipe containing green-lipped mussel extract, silica and MMP© (mollusc protein) provide nutritional aid to bones and joints. The digestive system is improved by the natural power of dried moor and green mineral soil. For the older large dog from 6 years and the older small dog from 7 years. Our Senior recipe has been carefully developed to meet the requirements of your dog as he gets older. Important secondary plant matter from ginseng, marigold and grape seed extract offer nutritionally healthy protection for the cells and look after your dog’s organs into his old age.